Picky Eater Bento #1! Vegetarian Back to School Recipes! Homemade Hummus without Tahini – Healthy Snack for Picky Eaters! Hummus is such a simple, versatile dish, and it’s loaded with plant-based protein and fiber! But, some folks (especially kids and toddlers) just aren’t fans of the traditional hummus ingredient: tahini. Luckily, you can make this kid friendly homemade hummus WITHOUT tahini! I know, some hummus purists will say that ‘it’s not truly a hummus without tahini.’ And, that’s just fine—I’ll still call it homemade hummus without tahini. But, you can call it a chickpea dip, or whatever you like! Either way, it’s an awesome healthy snack for kids—especially picky eaters—and a great way to fit more nutrition and protein into their day. And, you can serve this homemade hummus without tahini in SO many ways, whether it’s a dip for veggies, spread onto a sandwich, or used in a salad dressing! Don’t get me wrong, I’m personally a big fan of tahini. Similar to a nut butter, tahini is just sesame seeds blended into a paste. It’s creamy, salty, and actually loaded with wholesome fats, protein, and other nutrients! But, not everyone is a fan, and it isn’t the most kid friendly ingredient. Often, kids and picky eaters are more sensitive to bitter tastes, and tahini does have a hint of bitterness. So, this homemade hummus without tahini can be an awesome option for those more sensitive taste buds! And, chickpeas on their own have a very mild, neutral, savory taste. Perfect for blending into a creamy dip that kids can enjoy! 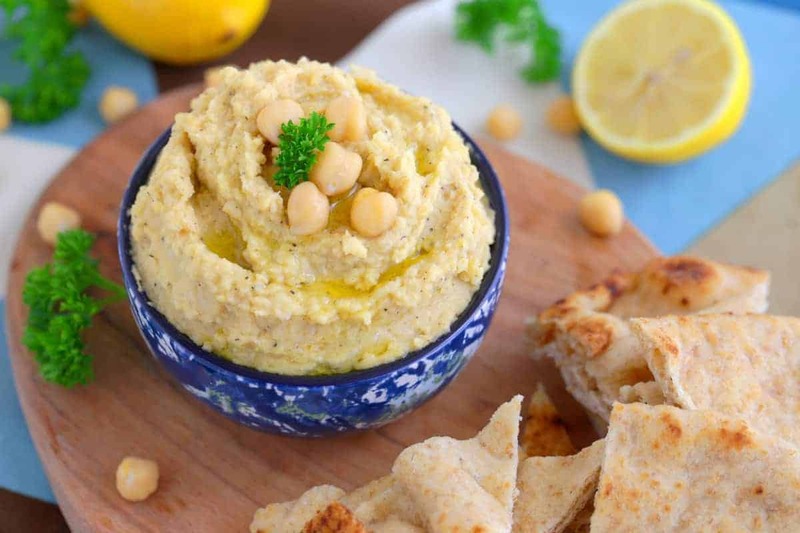 Plus, chickpeas are loaded with plenty of protein, so this homemade hummus without tahini is still a nutritious spread for sandwiches or at snack time. Just without the hint of bitterness! In a food processor, add drained and rinsed garbanzo beans, olive oil, lemon juice, cumin, salt, and pepper. Blend until smooth and creamy, adding water to adjust consistency, if desired. Transfer to a jar to store and refrigerate. Serve with raw veggies, crackers, or your favorite dippers! Yields ~1½ cups homemade hummus without tahini. Homemade Healthy Hummus - 3 Ways! !